"The Third Way" is here!!!!!!!!! Please share this with everyone you know! My Dad and brother camped out last night on the Via de Concilazione in order to try to get into St. Peter's Square for the Canonization Mass of JP II and John XXIII. Here's a report from the overnight expedition. I don't think they got much sleep, but it didn't seem to be a big concern. Why No Mass on Good Friday? First of all, what is the Mass. It is the unbloody sacrifice of Calvary re-presented. The question arises - are we "re-sacrificing Christ"? Was Christ's sacrifice not enough? So to get to the heart of the matter - if the Mass is an "unbloody representation of the sacrifice of Calvary, wouldn't Good Friday be the PERFECT day for Mass?" 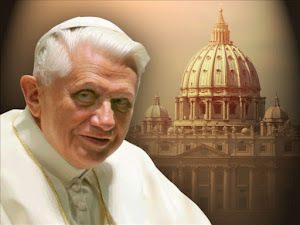 "Precisely because the Mass is a sacrament, it is a sign (not a mere sign, but a sign which contains a reality). However, in the commemoration of the Passion on Friday of Holy Week, the reality of the sacrifice is presented to the faithful not as a sacrament (i.e. not through the Mass) but “as it was really accomplished.” The Good Friday liturgy is, in fact, a more perfect re-presentation of the sacrifice of the Cross than is the Eucharistic liturgy. The Catholic faithful are more perfectly united to Calvary on Good Friday than they are by the offering of the Mass on any other day of the year. ..
...Not of course, that there is anything lacking in the Eucharistic sacrifice offered every other day; but the Church, on Good Friday, recalls (with a special efficacy) the Lord’s Passion in its reality and not in its figure... There is no defect in the Eucharistic sacrifice: It is real and true, as a sacramental reality (and the sacraments are certainly real). ...Still, on Good Friday, the sacrifice of the Cross is offered and commemorated not as a sacrament (that is, not as a figure or sign), but in the reality of its proper species – “as it was really accomplished.” Thus, just as the figure passes away in the advent of the reality, the Church does not offer the sacrifice of the Mass at the Good Friday commemoration of our Lord’s Passion. Jesus Washed Judas's Feet. Who is Your Judas? Who's in the Third Way? We were SO BLESSED with WONDERFUL interviews for the Third Way. We're also extremely excited to be able to start releasing the names of our interviewees. Here are two screenshots of two DYNAMITE interviews that will be part of our film. Jason Evert was an AWESOME interview in the mountains of Colorado! Christopher West had so many good things to say! What Have You Been Up to Father? Here is their "Peter Canticle"
And the haunting "It is Done"
And, of course, the mother of all Holy Week music - Allegri's "Miserere"
In light of #1, #2 can be hard because, let's be honest, the Devil is kicking our rear-end. But we shouldn't be surprised by that. Because, as the saying goes, "the Devil never sleeps"
Tolkien portrays Satan as "a great eye, lidless, wreathed in flame". The eye never shuts, but is kept awake by the burning fire of hate from within, like the sun that never goes out because of the nuclear reactions taking place inside it. Here's why we generally are losing the fight against the culture of death, sin, etc. - because while the Devil never sleeps, I do. While the Devil never takes time off from his steady and constant regimen of hate, I take time here or there to be with friends or family, to read a good book, to go for a run, to visit a sick person, to enjoy a nice meal, or to sit in Church and pray. The Devil never sleeps, but I do. That's why, on this side of the veil, evil generally "wins" in the sense of seeming to be the victor (even though the victory is in appearance only). Satan strikes me as the sad and pitiable stockbroker who is always working, has tons of money, gets what he wants, but hates himself in the process and is quite miserable. The culture of life and love is "losing," and I'm perfectly fine with that because I enjoy spending time "having life more abundantly, and having it to the fullest." O my God, I am hardly sorry for all your sins with all my heart because I dead the pains of Heaven, but most of all because I have offended you my God who art all good and de...de...serv...ing of all my love. I de...de...dezest all my sins. In choosing to do good and failing to do wrong you have sinned against me who I should love with all my heart. I firmly dissolve, with all my heart, to do penan....penan.....pentance and to sin more. Amen. As a follow-up to the story of Nathan Trapuzzano, the 24 year old abortion sidewalk counselor who was murdered last week, I wanted to share the homily from his funeral. Fr. Chris Roberts (my neighbor and a good friend for my brief time at the North American College in Rome) gave a homily that, as any preacher will tell you who has preached at moments such as this one, can only be ascribed to the grace of the Holy Spirit. 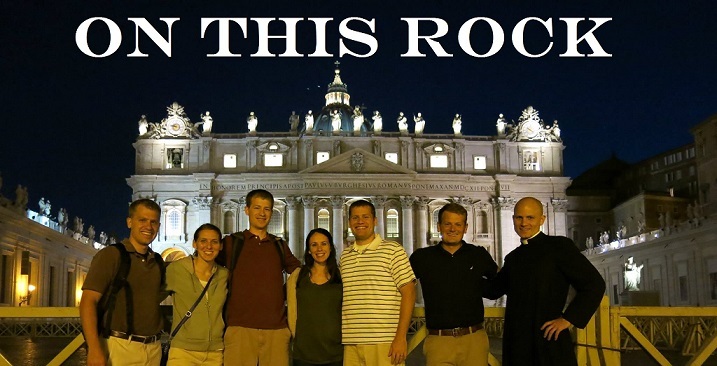 I can't encourage you enough to click HERE and visit Fr. Roberts' blog to read the homily. May Nathan and the souls of all the faithful departed, through the mercy of God, rest in peace! "What is a Godparent? Can my satanist cousin be a Godparent?" 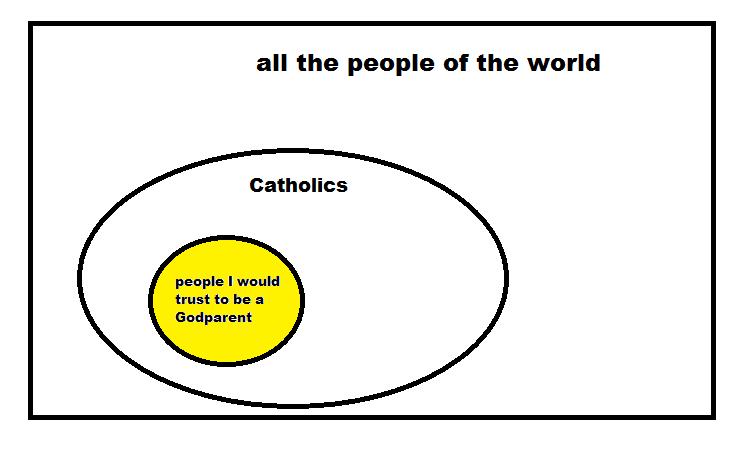 A quick note about what a Godparent is: a person who will help ensure that a person is raised in the CATHOLIC Faith. 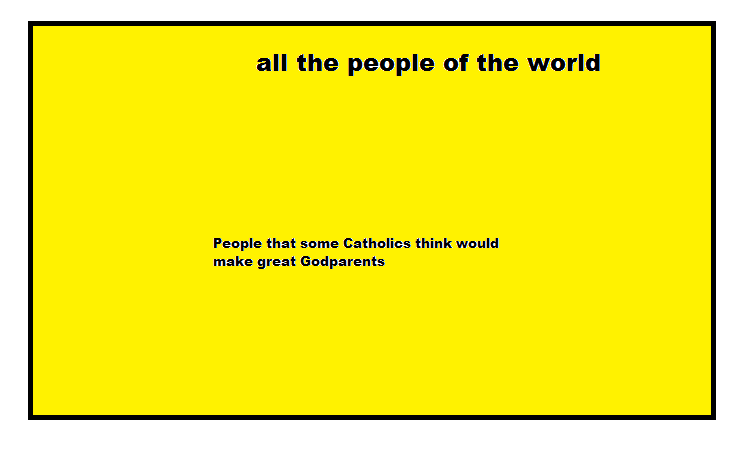 I have no idea why anyone would have a non-Catholic Godparent. How about asking a Catholic to help pass on the Catholic Faith to your child if, God forbid, something should happen to you and your spouse? Q. 1. To qualify as Godparent, does the person have to meet certain requirements? One of Truth and Compassion's sidewalk counselors for our Saturday morning coverage at the Clinic for Women (W16th St.) was out jogging around his neighborhood near the abortion clinic early this morning when he was attacked and shot. Reports indicate Nathan Trapuzzano was pushed between two buildings and gunned down without provocation. Nathan's wife, Jen, is to deliver their first child next month. Nathan is 24 years old and a faithful sidewalk counselor. He and Jen have been with Truth and Compassion for about a year. Nathan used to walk by the abortion mill and would encourage Ben Manring, another of Truth and Compassion's stalwart volunteers in street ministry. Nathan would say to Ben that one day Nathan and Jen would come back and stand with us. One day, he and his wife did just that. And Nathan came to stay, becoming a reliable part of our outreach. Whenever Nathan was needed.... no matter the time... he made himself available and was quick to let me know if he would not be able to be a part of the coverage. Please pray for Jen and their baby girl. Please pray the attackers are quickly apprehended and brought to justice.